I have a 1000 litre tank housing two porcupine puffers, a guinea fowl puffer, a small moray eel and a Foxface. They have been together for over two years now. I feed them a wide range of seafood and also pellets. In the last month they all turned off eating for some reason and didn't seem happy. Water tested out fine on different test kits. then he would slowly sink down to the bottom and rest on the bottom. Today he is still spinning in circles but mainly resting on the bottom until I fed him then afterwards went right back down. However, he is eating fine, color is normal, and breathing is normal. I feed them both silversides, frozen krill and half-shelled wild caught oysters. My Blue Spotted Grouper is acting completely normal. However, I have noticed that sometimes the two get into little fights (I guess over territory and hiding places). I was just wondering what you thought it could be. Any help is greatly appreciated! I don’t want to see my baby suffer. Hi again! Do you think once I change the puffers diet I can save him? If so how long do you think I have (time wise) to do this? I really don't want to lose him! feeding him something different. I have frozen calamari rings, is this something that I could feed him as well? <Ah no... better to select a bag of "frozen seafood" for human consumption. that I'm giving him the right nutrition. Good afternoon. We are going to get a dogface puffer soon and I was wondering, what kind of crabs would be best for him to eat? He is rather small right now. Maybe a couple inches long. Are purple shore crabs beneficial for him? If not, what are the best kind of crabs to feed him? I recently got a 4 or 5 inch Dog Face Puffer. I hear about and see the tooth that needs hard things to wear down. I went to the supermarket and bought some white clams. I put them in a bucket of saltwater for a bit and put a couple in the tank. The puffer does not seem to be interested in them. I had to buy a dozen so I gave some to my LFS and kept 6. I put the other 4 in my sump. I am unfamiliar with clams so I was wondering if it is ok to keep them or just crack them open to feed the puffer. It seems to defeat the purpose of the puffer using his tooth on the shell. that I buy from the grocery store. I soak in some Selcon vitamins a couple times a week. I bought some live feeder shrimp also that I know the fish all liked but this puffer is not much on hunting, he just likes me to feed him with my feeder stick. He seems to eat two or 3 bites and then goes off to his favorite cave he shares with a small snowflake eel so I'm guessing he is getting his fill. I feed the fish a few times a day. I read your link on puffer fish but just not clear about the clams and if I should keep them in the tank if the puffer does not eat them. Thanks for sharing your smarts about this not so easy hobby! 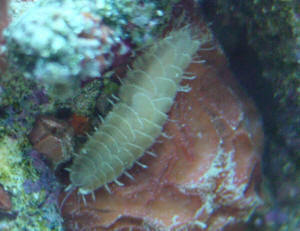 "<Frozen I hope/trust; not live>"
They were live white clams, is it a problem to have them in my tank? and he will destroy them all day I have tried silversides, raw shrimp, and scallops but he won't eat them although my snowflake eel will gladly take any of those. Should this be a concern I feel like he should be eating a lot more then pellets. I know the NLS pellets aren't vegetarian by the way and they are quite good as a staple for my tangs just not sure about the puffer and what to do here. Advice? For now have bought the large 3mm version of the pellets and am feeding. him with those. Got some good info off Neale the other week about food for my puffer. All I am wondering now is how much I should be feeding him. One minute I think I am giving too much , next too little. and just got some lance fish. I tend to give him 2 items at a time and feed him twice a day. Keep reading they are big eaters but I am totally guessing at the minute. And yes didn't want to feed too much due to water quality issues. Spoke to you before and have had some good advice. Just wanted to check on some food I just bought for my Dogface. Trying to give him plenty of shells to chew on but am struggling a little. Have just bought some shell on prawns. Just looking now home and the description is Coldwater prawns and cooked. Is this ok ? Ingredients just says 98% prawns plus salt. That was the good advice I had. Feeding cockles mussels and small fish. Prawns like mussels the occasional treat. Just wasn't sure as it said coldwater and cooked. Don't want to get into dentistry down the line so trying to feed food with shells. I've been feeding my 7-8" dogface puffer clams, shrimp, oysters and squid. I'd like to get him to munch on the larger NLS pellets. The problem is he doesn't look at these as a food source. They just fall around him...even landing on his head...but he has no interest in them. I don't think he realizes it's food. Do you have any suggestions on how to get him to try the NLS pellets? I was feeding my fish with a rather large piece of squid. My trigger and puffer were taking small bites while I was holding the squid. Then, out of nowhere my Spanish hogfish came out & lunged for it pulling it from my grasp. He let it go and my puffer somehow just inhaled it with one gulp. This happened 4-5 days ago. The last 3-4 days my Dogfaced puffers behaviour has dramatically changed. He just mopes under the rock the whole day. He was quite active before this incident. Has little to no appetite as well. Today I noticed that he does not even open his mouth. Do you think that the large amount of squid he inhaled is causing some type of problem and what can be done about it? Golden puffer crushing the food but not ingesting -- 04/07/07 I recently acquired a golden puffer form an online vendor when I received the fish its color seemed to be rather faded. At first the fish seemed to be doing quite well. I quarantined the fish for the first 2 weeks. <A rather short quarantine, at least shorter than the lifecycles of the most common parasites.> After seeing no sings of illness I moved the fish to my 300 gallon show tank. Once in the 300 gallon I started to notice that my imperator angel and my golden puffer where having a territorial dispute. I figured that this would subside in several days and did. On the second day of being in the 300 gallon tank the fish appeared to be eating well again with no problems. Thus I assumed that everything was fine with the fish. Well around 2 weeks ago I noticed that when the fish would eat he had a great appetite. But rather he would not ingest the food. He would chew the food and spit it out not ingesting any of it. Any ideas what might be causing this. <Puffers are messy eaters. They try food by taking a bite and crushing it. Things not liked are spit out again. Offer prawns, cockles and mussel flesh and see if you get a different reaction. 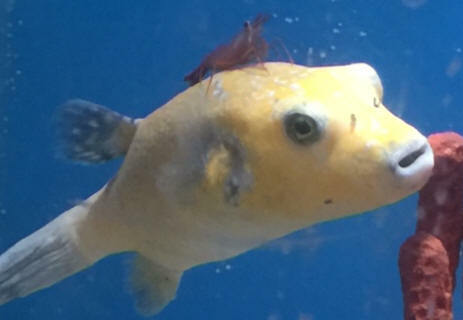 Have a look at http://www.thepufferforum.com/forum/ to exchange with people owning the same puffer species.> I do know that their teeth sometimes become over grown in an aquarium, but this is not the case in this fish. Thanks Sean. Dogface puffer 9/7/05 Hi found your site today!!! Love it!!! We have a 75 gallon tank with two lions, a dog face puffer, and a wolf eel which was previously a reef tank and still have live rocks in tank. We have a trickle filter and protein skimmer. Is there any additional filtration that would cut down on the time between water changes. <Mmm, yes... most any additional filtration, of all modes would help here... but... what you really need is a much larger volume system> Also, we've heard of double osmosis systems that we could use to make our own salt water at home. Is this necessary or is there any easier way, like store bought water that could be used with our oceanic sea salt mix? <There are a few inputs, things to say... please read here: http://www.wetwebmedia.com/seawater.htm and the linked files above where you lead yourself> What is the typical size for a dog face in captivity and will our tank be large enough for our current stock? <Mmm, likely six to eight inches... more than a foot in the wild, in large systems in captivity. It will be much better off in a bigger (twice plus the 75) system> I read about people hand feeding their puffers. Are they actually reaching into the tank? <Sometimes yes... take care... sharp teeth... and your lions...> Our puffer is very friendly and we have touched him but I don't want to stress him or do anything wrong but of course I want to maximize my relationship with our fish. The last thing is our eel and puffer rub on each other a lot. They both seem to enjoy it but should we be concerned about an aggression problem that we are not recognizing. <Mmm, more likely friendly than agonistic. No worries. Cheers, Bob Fenner> Blue Dogface Puffer Not Eating (7-9-05) My wife and I have a 125 FOWLR setup. It has been up and running for over three months now. We have had a Picasso trigger in there for about a month. He is only 4 inches at the moment. Yesterday, we purchased a Yellow Tang (5 inches) and a Blue Dog Face Puffer (4-6 inches). After we acclimated both of the new fish, we placed them in the aquarium. In under an hour, the tang was doing fine. The dogface just hid behind some live rock. He would come out occasionally, and then right back to the hiding spot. This morning, the tang and trigger were feeding, but the puffer has no interest in food, although he was out and about. First question is: Have you ever heard of a blue dogface puffer? <No not that I have heard of. However, there was a discussion back and forth about blue porcupine puffers. I was told by a LFS that some of these new puffers were coming in. I was curious but had never seen or heard of this color variant. I emailed the rest of the crew inquiring and the general consensus was that the fish must have been dyed, although the LFS did not believe this to be true. A. nigropunctatus is the species most commonly referred to as dogface puffer and these fish have several color variations including black, gray, golden and a splotchy mix thereof, but I have never seen or read about a blue color. So my guess is the fish has possibly been dyed.> The second question is: How long should it take him to feel comfortable enough to feed? <It is always a good idea to ask to see the fish eat prior to purchase. That said, he may just need some time to acclimate to his new home. Keep the activity around the tank to a minimum and perhaps reduce the lighting for a few days. These guys are known to go on hunger strikes and can if previously well nourished and in good weight survive quite a while off their feed. Continue to offer him a variety of meaty fresh and frozen seafoods daily. I have had the best luck tempting reluctant feeders with krill and believe it or not lobster. The local Asian market, if you have one nearby, is a great source for a variety of seafoods. Try clams, squid, oysters, shrimp, small crabs, prawns, or any other meaty seafood (excluding freshwater fish and mussels) Trader Joe's is another excellent source for reasonably priced frozen seafood. If he's still being stubborn, give some small live crabs, snails, or even ghost shrimp from the local fish store a shot. Ghost shrimp should be gut loaded first by feeding them with a high quality flake food prior to feeding them to the puffer. 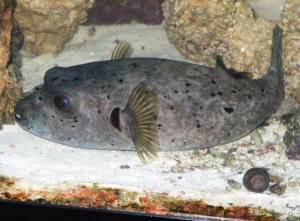 They are usually kept in freshwater tanks, so drip acclimating them to saltwater prior to feeding them will prolong their survival in the puffer's tank. If all else fails the next thing to try is some fishy 'junk food', AKA live brine shrimp. These may induce a feeding response when nothing else has. However these nutritionally void little shrimp should be saved as a last resort. Be sure to stay on top of you water quality.> I am an engineer at a local hospital, and I also take care of the marine aquariums we have there. <Excellent, what a nice aspect of your job!> The hospital has a rather large dogface (normal brown/yellow coloration). When he was introduced to his aquarium, he was eating the same day. <I think most do, they are typically pretty good eaters.> Any info you can give me would be greatly appreciated. Thank you. <You're most welcome. Hope this was helpful and best of luck with your new Puffer, Leslie> P.S. I would love to see a photo of this fish.